The current state of the forklift industry looks positive, despite some overblown fears and concerns about automation and robots (more on those subjects below). The manufacturing, mining, distribution and construction industries – just to name a few – remain as busy as ever, and growth in those areas is expected to continue well into the 2020s. Whenever those four business sectors (construction, mining, manufacturing & distribution) are productive, that’s great news for anyone involved in the forklift industry, including forklift drivers! So right now, the forklift industry is strong. Gazing into our crystal ball, we obviously can’t predict everything that’s going to happen with 100% certainty. However, our team here at CertifyMe.net looked into this subject recently, and we came up with some interesting data regarding the future of the forklift industry. Robots – many forklift drivers are concerned with the advancement of robotics technology, specifically how robots might end up replacing human jobs. Automation – as factories and workplaces become more efficient with automated processes, forklift drivers are worried that their unique role might be at risk. We looked at this issue from a data-driven perspective, and we’re happy to report it’s not all bad news! Employee outlook – will forklift driving jobs still be in demand years down the road? Our research team has revealed some promising data, so keep reading! CertifyMe.net, the leader in online OSHA-compliant forklift training courses, believes the future is bright for forklift drivers and others involved (directly or indirectly) with the forklift industry. If you talk to anyone in the forklift industry, it’s hard to ignore the subject of robotics. Whether it’s scary worker replacement stories or news about robotics impacting forklift driving jobs – even in the service industry – there has been a mini-panic of late involving robots and the forklift jobs forecast. Thankfully, many experts don’t think that widespread use of robots in industries where forklifts are used – namely, distribution and construction – means that forklift drivers will be replaced anytime soon. In fact, a recent study from the economics department at New York University shows that most of the concerns about robotics aren’t justified. Plus, some of the advancements in robotics are designed to improve forklift driving functions – not replace jobs! From our vantage point, forklift driving jobs aren’t under immediate threat from a mass infusion of robots in the workplace. A few years ago, the United States Occupational Health and Safety Administration (OSHA) started to automate their accident investigation and injury report forms. Today, electronic forms are processed faster than traditional paper ones. This is just one illustration how automation impacts the forklift industry. On a more practical level – the lumber yard, warehouse, construction site and more – the fears about automation obsoleting forklift driving jobs are overrated. A recent study from OSHA concluded that forklift drivers will remain a critical part of the industry for decades to come. To make yourself even more marketable, we recommend having the most recent forklift training – it never hurts to stay as employable as possible. Automation will impact the industry, for sure, but forklift drivers with the best training backgrounds will certainly enjoy more job security! If you’re a forklift driver today, you’d like to know what the job market will look like in the next decade – and beyond. Well, we have some good news: according to the latest economic forecast, the worldwide global forklift market will grow between 6-8% annually into the early 2020s. Bottom line: don’t get too caught up in automation and robotics for now. Forklift jobs will be available – and in demand – for years to come! The forklift driver’s job market is directly related to the global market. And that’s good news, if you’re a forklift driver! The global forklift market is expected to grow 7% per year through 2021, so forklift jobs should continue to be in demand. 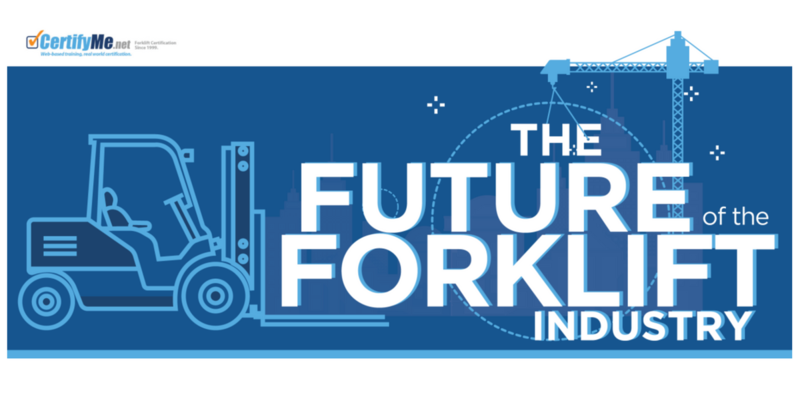 For today and into the future, the forklift jobs market will remain as competitive as ever. To give your job prospects an advantage over other candidates, we recommend CertifyMe.net for all of your training requirements. Our proven, effective training methods are ideal for rookie drivers, veteran forklift drivers and everyone in between. If you’d like to give yourself the best possible chance to get a forklift driving job – and keep it for years to come – please call our OSHA forklift training experts today at (888) 699-4800.